Musclepharm BCAA 3:1:2 capsules - with them you get a patent-pending branched chain amino acid complex that not only delivers when it counts but gives you precisely what your body needs. With the ideal mix of l-leucine (3 grams per serving), l-valine (2 grams) and l-isoleucine (1 gram), you're getting all the vast benefits of BCAAs before and after a workout. It's the perfect combination of BCAAs to reduce muscle breakdown, fueling muscle development, increased lean body mass and even aiding in fat loss. There is nothing suberb about Musclepharm BCAA 3:1:2 and your results will be proof of that. This BCAA complex is pure and all about performance. 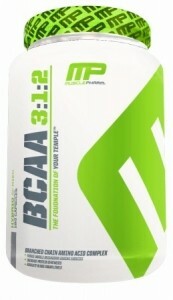 With MP's BCAA 3:1:2, you're giving your body the best chance to develop lean mass more effectively. With three grams of leucine per serving, it's the perfect amount of one of the essential amino acid powerhouses to help induce muscle growth. Leucine not only has the capacity to stimulate muscle protein synthesis, it has been suggested to slow muscle damage after intense training by increasing the synthesis of muscle proteins. Consume 1 serving (8 capsules) Musclepharm BCAA 3: 1: 2, one to three times daily.